None of the manufacturers actually called them that, but it was a generic term to describe somewhat sporty, sophisticated coupes that emphasized comfort over performance. After the appearance of cars like the Mercury Cougar in 1967 – with its leather interior, V-8 engine and raft of options – the market for personal luxury coupes took off. The first Cougar – introduced in 1967 as a slightly elongated Mustang – eventually gave way to the second generation car in 1971. It might have looked bigger than the original Cougar, and it did have a one-inch longer wheelbase, but was actually a few pounds lighter than the 1967 to 1970 car. 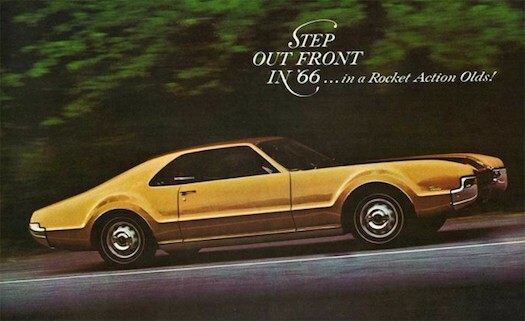 Unfortunately, it never sold quite as well, since it was suddenly under pressure from just about every other American car builder in the 1970s. You started with a 351 Windsor, and could eventually work your way up to a 429 Super Cobra Jet in 1971, but that engine disappeared after the first year. The 1973 edition was the last Cougar convertible available. In these three model years, Mercury managed to find driveways for more than 580,000 Cougars, making these the most popular Cougars ever built. 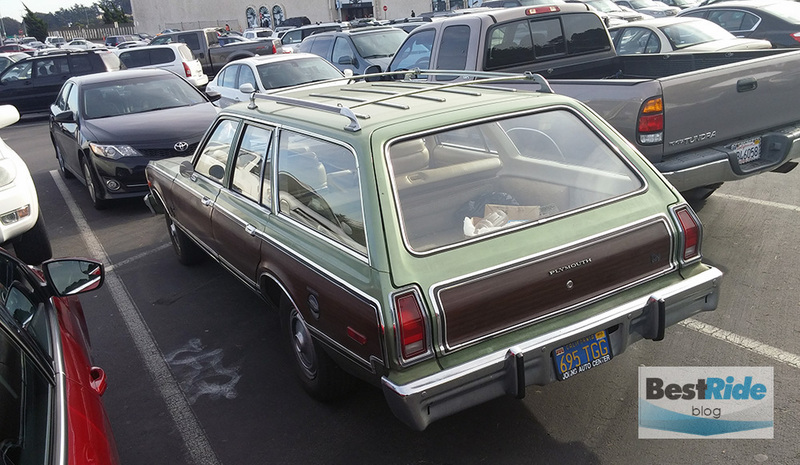 In 1978, Mercury sold over 213,000 Cougars, and over 166,500 of them were highly optioned XR-7s. These years shared the old intermediate-size Torino platform with the Ford Thunderbird, and were equipped with either a 302-, a 351- or a 400-cubic inch V-8. 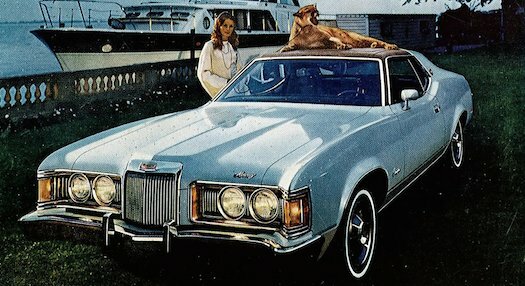 Cougars had always been either coupes or convertibles, but for these model years, you could purchase a four-door sedan, or even a super-rare Cougar wagon. These full-luxury cars aren’t fast, but they had a formal, 1970s presence that you can’t ignore. In 1966, General Motors was one of the most forward-looking, risk taking car companies in the world. Every single division had some unique engineering masterpiece: Turbocharging at Chevrolet, aluminum engines at Buick, overhead cams at Pontiac, and front-wheel drive at Oldsmobile. 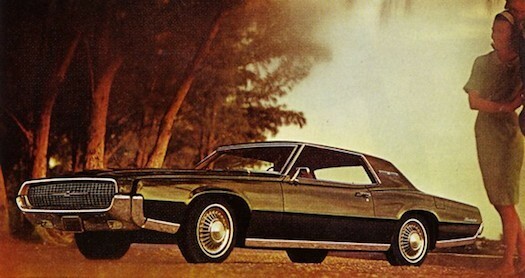 The Toronado not only brought superior foul weather traction thanks to driving the front wheels, it also provided comfortable room for five in a personal luxury coupe. The styling of the first and second years were the most handsome, but even up until 1970, they were still distinctive on the road. Just making the “1970s” cut by being introduced in 1978 as a 1979 model, the third generation Toronado went on a drastic weight-loss program, shedding over 1,000 pounds between the 1978 and 1979 model years. It lost almost two feet in length, yet somehow managed to add passenger space. 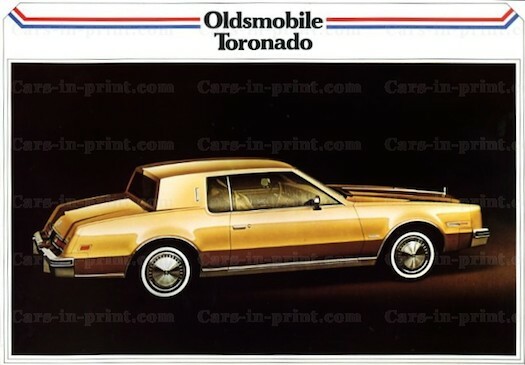 While Trans Am buyers fretted that they were getting Oldsmobile engines, Toronado buyers were completely satisfied with the available 350-cu.in. Olds V-8 available in the Toronado, though not so much with the diesel variant. The 1971 to 1978 Cadillac Eldorado was obscenely American. If you were filming a movie and needed to find a car for a loudmouthed Texas oil man, the Eldorado would be it, complete with steer horns mounted to the hood. In 1973, it was chosen to pace the Indianapolis 500. Let that sink in for a moment. An Eldorado, even with a 500-cu.in. V-8 under the hood, couldn’t pace a wheelchair race. Yet, the Eldo was a Cadillac sales smash, selling 51,000 units that year. The 1976 Eldorado Convertible, which has the distinction of being one of the last convertibles built in America until the mid-1980s, was also a windfall for Cadillac, with 14,000 units delivered, many of which were put away by collectors as a guaranteed collector car investment. That didn’t work out so well. The ’67 to ’71 Thunderbird is kind of the forgotten T-Bird. These big Fords were hot on the heels of the 1966 to 1970 Buick Riviera; the hideaway headlamp/Remington shaver styling up front should be the most obvious indication of that fact. These cars were both weirdly formal, with chrome carriage-top faux hinges, and intensely modern, with jet-fighter-inspired interior design and wraparound bucket-style seats in the rear. This bodystyle marked the end of the line for the Thunderbird convertible until its reappearance in 2002, and it marked the debut of a short-lived, suicide-doored four-door Thunderbird. If you’re interested in late 1960s and early 1970s Fords, the Thunderbird is a bargain. You can find 429-powered T-Birds in the sub-$5,000 range with little effort. If the 1963 to 1965 Riviera features the most highly regarded styling of any American coupe, the 1979 to 1985 Riviera is the most ubiquitous. 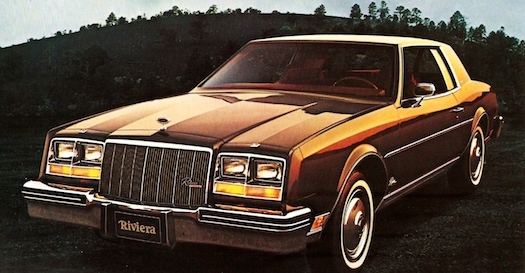 Like the Toronado and the Eldorado of the same vintage, the Riviera went on a crash diet in 1979, losing half a ton in a single model year. These were also the first front-drive Rivieras, despite the fact that the 1966 to 1970 model years looked a lot like the front-drive Toronado and shared a lot of sheetmetal. Extra cool was the Turbo and later T-Type which featured the same 3.8-liter, 185hp turbocharged V-6 from the Regal T-Type. It’s hard to even say Cordoba without putting on Ricardo Montalbon’s accent, but we’ll try and get through it. 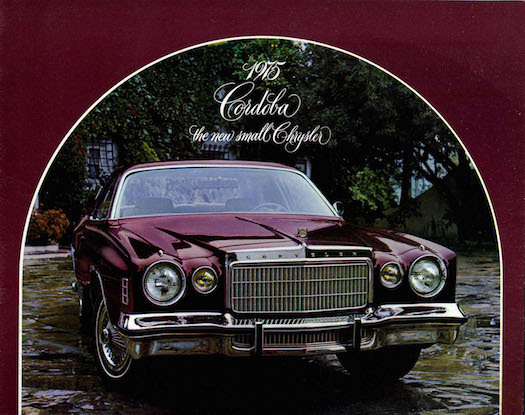 The Cordoba was Chrysler’s intermediate-sized personal luxury coupe and it took the Spanish theme co-opted by the Monte Carlo to dizzying new heights, from the Argentinian cordoba coin featured in the hood ornament, to the Corinthian leather (dammit, Ricardo!) inside. 1978 and 1979 bodystyles had stacked headlamps, but for our money, the early round headlight cars are where it’s at. 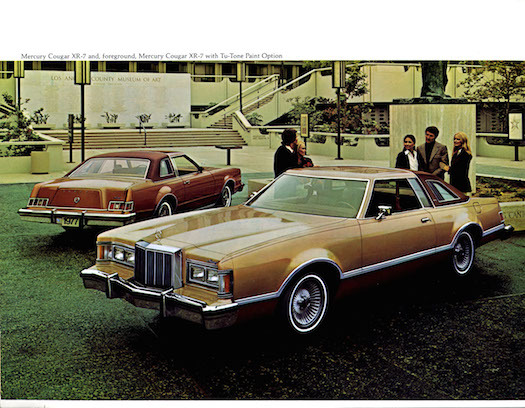 The 1973 to 1977 Grand Prix ranks second because it was the second-best-selling personal luxury coupe of the 1970s, and because it’s so freakin’ cool. 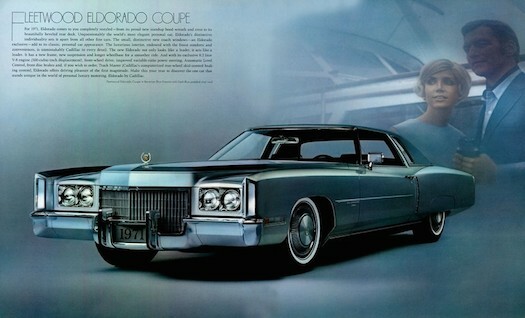 It’s based off of the Colonnade bodystyle Malibu/Skylark/Le Mans/Cutlass juggernaut, so they actually drive and handle well, and the GP featured more “performance oriented” touches than the Monte Carlo did, with deeply tunneled gauges, “Radial Tuned Suspension” and a boattail-esque rear section. 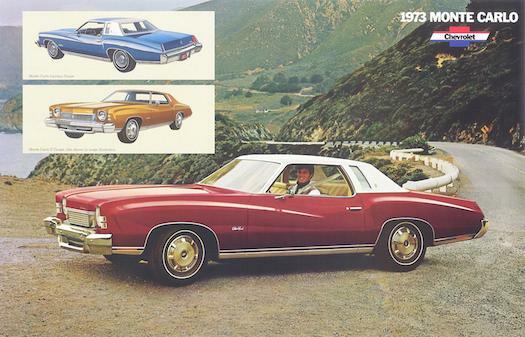 In 1973 alone, Pontiac sold 150,000 Grand Prixseses, mounting a serious campaign against Chevrolet’s Monte Carlo. The earliest cars feature the least obtrusive bumpers and the ability to purchase a 455-cu.in. V-8. The 1973 to 1977 Monte Carlo is the undisputed king of personal luxury cars. 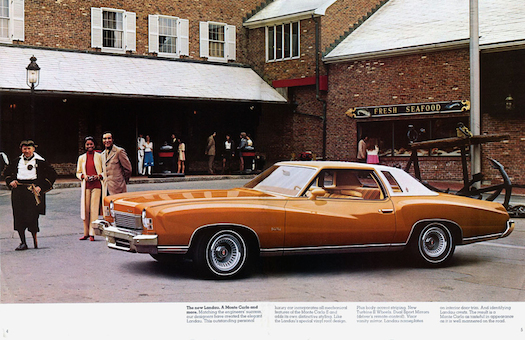 When the Colonnade-bodied Monte Carlo launched in 1973, it became Motor Trend’s Car of the Year, and sold 250,000 units, setting a sales record for Chevrolet. Despite long lines at filling stations all over the country, Chevy sold another 300,000 in 1974, 250,000 in 1975 and 353,272 in 1976. 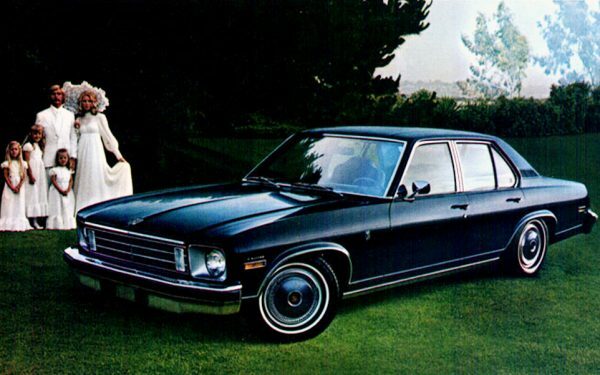 The 1977 model year was the last of this bodystyle, leading on to the downsized 1979 Monte Carlo. In Honor of Scotland's Vote - It's Scottish Car Day!